Fred and I had a great adventure on Thursday. 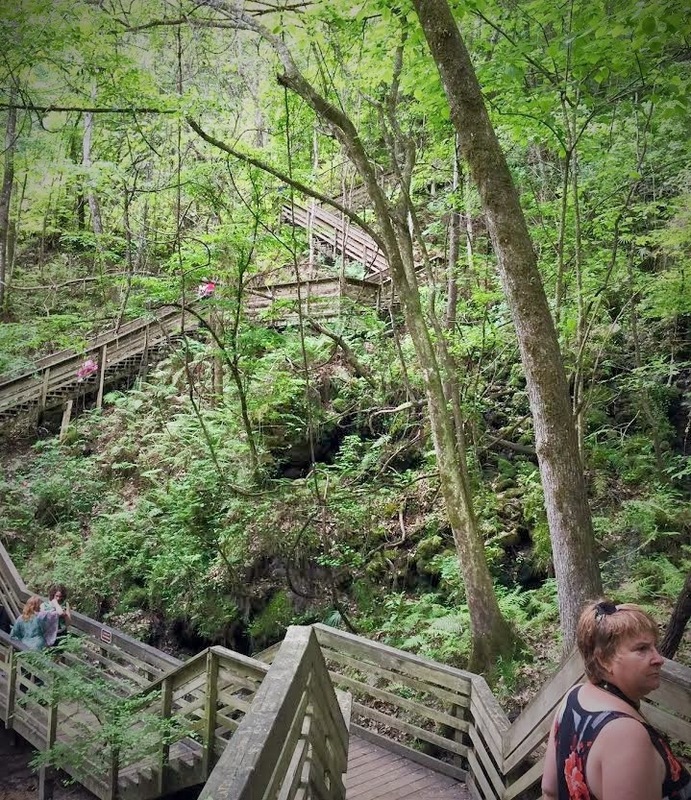 We visited another Florida State park, Devil's Millhopper in Gainesville. I would have gone just because of the name, but camping neighbors Bill and Sue Holt also recommended it. 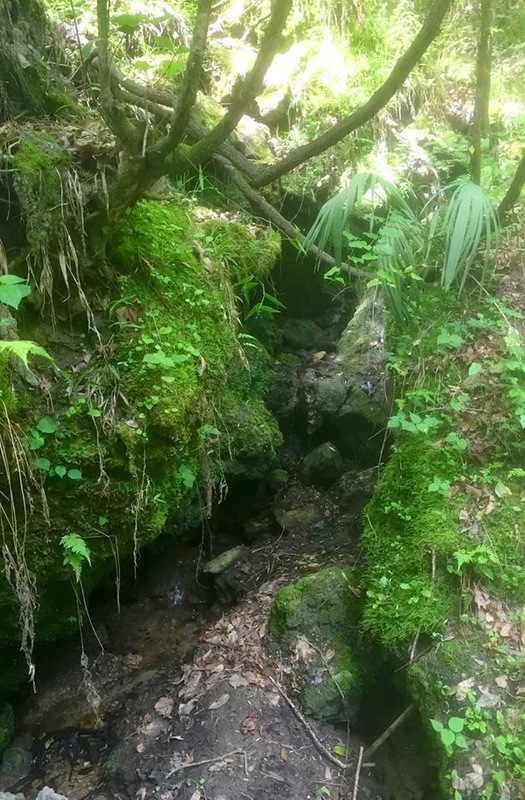 Devil's Millhopper is a Florida sinkhole. It's documented exploration began in the late 1800's and it has been designated a National Natural Landmark since 1976. Geologists have learned a great deal about Florida's natural history by exploring it's depth, which holds fossil sharks teeth, sea shells and the fossilized remains of extinct animals. The park around it is typical Central Florida landscape, tall pines and palmettos draped with Spanish moss and sandy paths for walking. There is a short trail (.6 mile) around the rim of the sinkhole that allows you to enjoy the scenery before descending into the sink. 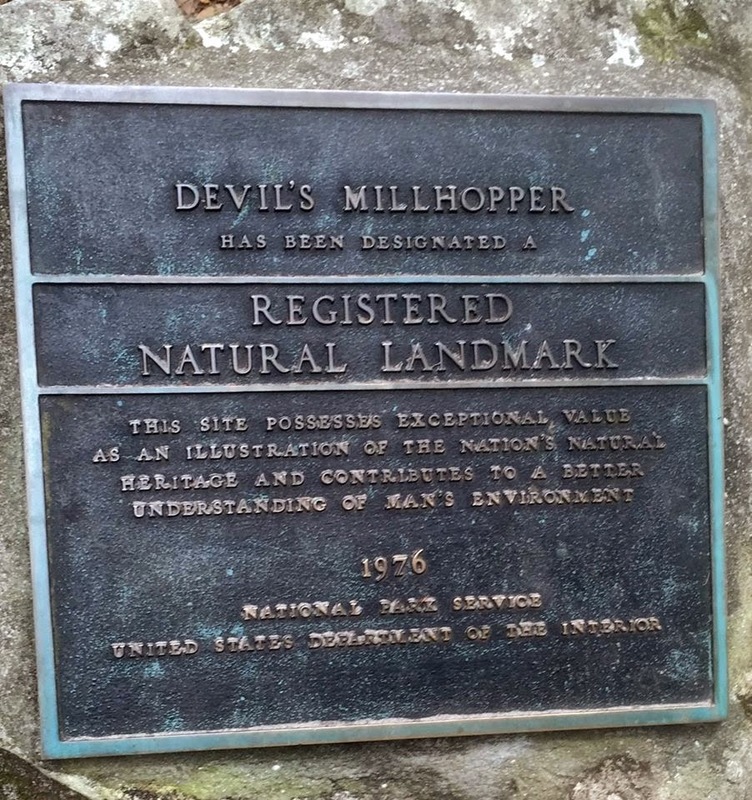 The Devil's Millhopper is 120 feet deep and 500 feet across. Access to the bottom is by a series of stairs and viewing platforms that lead you into the sink while preserving the fragile surrounding environment. Walking down the 232 steps we began to hear water trickling. Ferns and lush green moss began to line the walls of the sinkhole, and the trees were now live oaks and needle palms. We discovered many small waterfalls that appeared in the sides of the sinkhole. Little streams gathered from them and disappeared into a mist covered pool at the bottom. We spotted orchids among the air plants in the trees and tiny lizards running on the stairs. 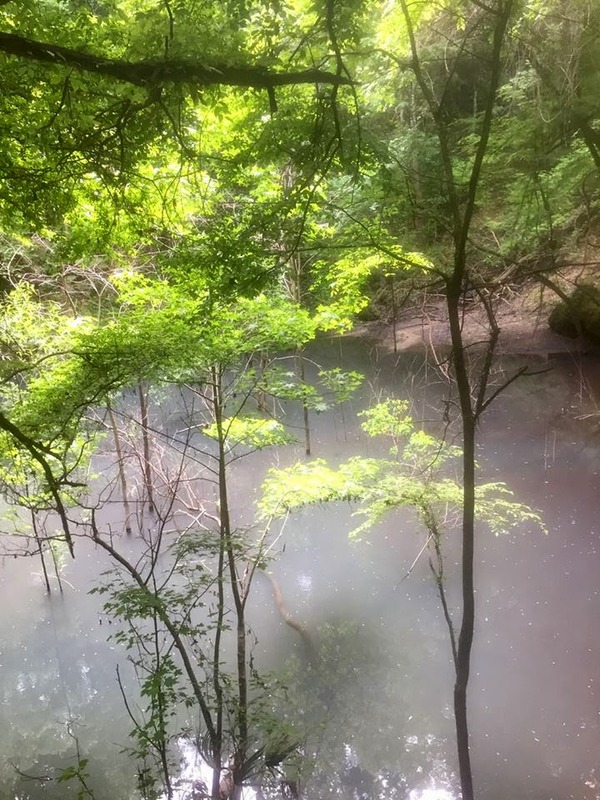 The bottom of the sinkhole has it's own micro-climate, lush, moist and green. We are told that even in the relentless heat of Central Florida Summers, it remains the same. The 232 steps back to the top took a little longer to climb, and required one rest stop but we made it. Devil's Millhopper was named by early pioneers. The shape of the sinkhole remaindered them of a mill hopper, the funnel shaped device that feeds grain to a gristmill. When they discovered bones and teeth in it's depths they believed that it was an entrance to Hell and occupied by the Devil. Native American legend states that the Devil's Millhopper was formed when the Devil fell in love with an beautiful woman. She refused his proposal and when he flung open the door to hell she was devoured. Today's black and white photo is of a Queen Conch on the beach of Conch Key, near Marathon. Taken in February 2014. I have run out of bloggers who want to be nominated to share a black and white photo each day for 5 days and to challenge another to do the same, so this is an open invitation for anyone to participate. Let us know if you decide to play so that we can check out your beautiful pix. I enjoyed this little state park. The sink hole was just so beautiful to see. I will be putting some more photos of the park on Facebook. Enjoy them. Wow, guys ....that state park is amazing! We will definitely check it out next time we are down there. It is a treasure Jim. Well worth the visit. I have been very impressed with the Florida State Park system. It is quite diverse and several are also National Natural landmarks.